· 【COMPATIBLE WITH ALEXA/GOOGLE ASSISTATNT】The wi-fi smart power strip can be voice controlled by Amazon Alexa and Google Assistant. 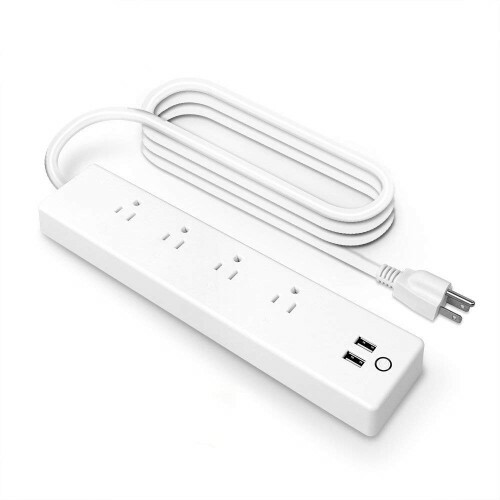 · 【REMOTE CONTROL】: Smart power strip outlet equipped with 4 AC outlets and 2 USB ports with 6ft extension cord, you can control 4 AC outlets together or control individually throught the mobile app from anywhere there is 2.4ghz wifi or 3G/4G network. (no hub required,but the 2 usb ports just can controlled together). 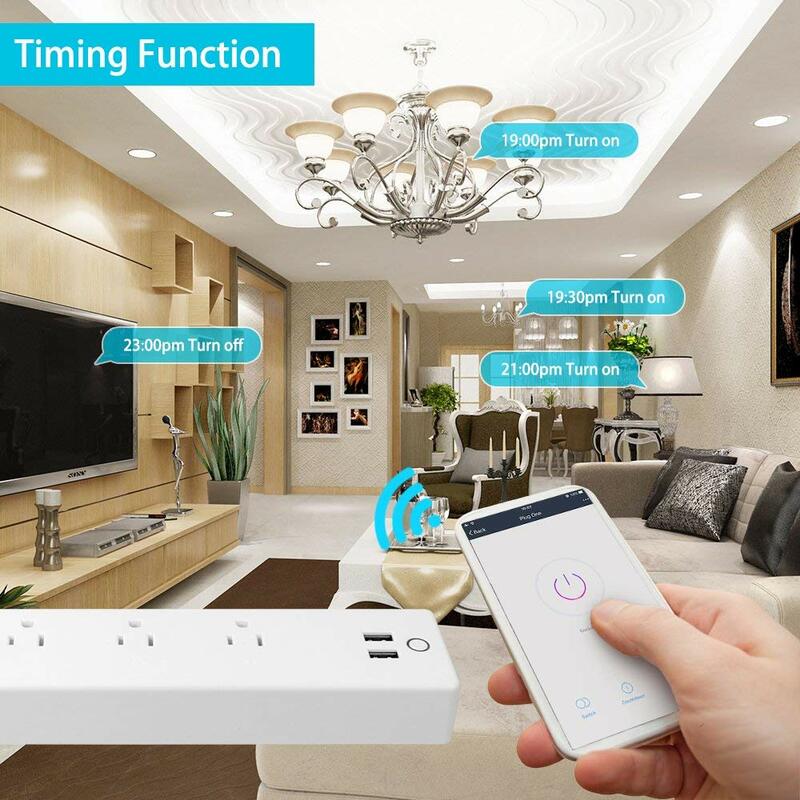 · 【TIMING FUNCTION】: Schedule your wifi smart power strip to turn on or off anytime as pre-set time, you can set up the time separately for each AC outlet as you needed. 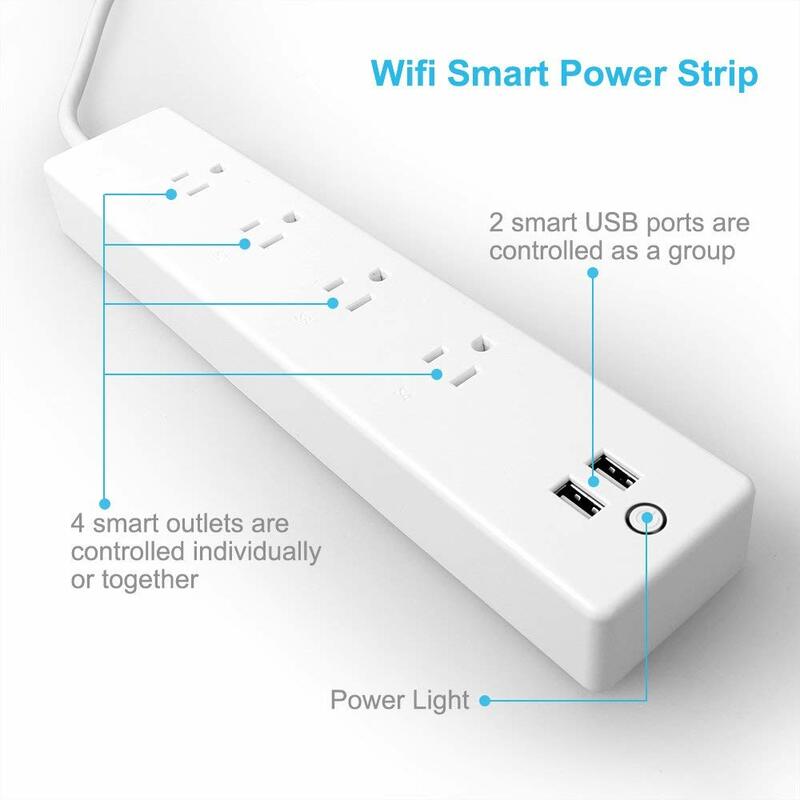 Each wifi smart power strip can set up to 20 groups of timing tasks. Share access up to 30 smart cellphone control. 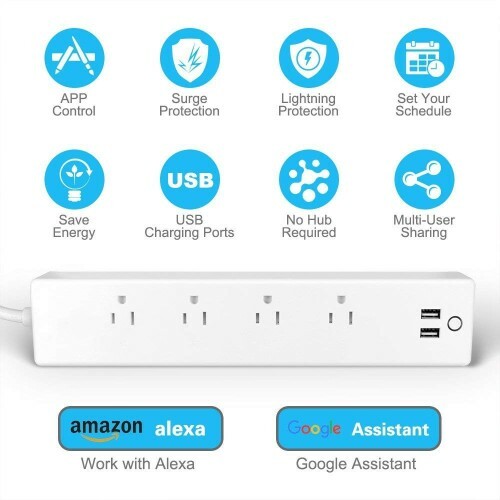 · 【USE SAFETY】: The wi-fi smart power strip is enquiped with surge protector, overcurrent protection,overload protection, over-heated protection and anti-lighting protection,can effective absorb the sudden huge energy, protect your equipment and your home safety . It also have a separate safety door to prevent children and pets accidentally touch the socket,keep away from danger. · 【EASY TO OPERATE】: Just plug the power strip into your wall outlet, download the free "smart life"app from your cellphone(works with iOS8 or higher/Android 4.2 or higher), add it into your account via 2.4Ghz wifi. 1. 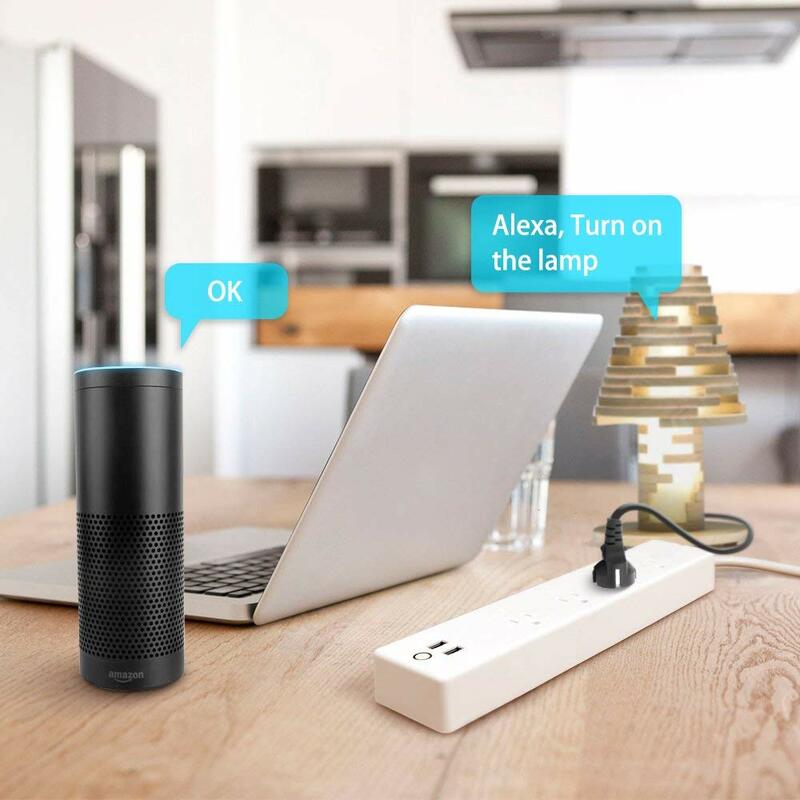 Plug the alexa smart power strip into a three-prong outlet, you will get a rapid green flashing light blink. 2. Download "Smart Life" app, register with phone number or email, then connect your Wi-Fi (2.4G Only) to enter to the home page. 3. Back to the menu, and press the “Smart home” button, Click "Add Devices", then click "Confirm indicator rapidly blink". You'll see "Connecting now". When it comes to 100% connected, you've already "Successfully added 1 device." * At "Connecting now", you maybe experience "Failed to add". Just click "retry" button. If the smart power strip can not be connected with App after 3 times, reset will be a good solution: Press and hold manual power button 6 secs, re- connect app after the smart power strip fast blink. 1. Open "Amazon Alexa" app on your smart phone or PC,find the "Skills" button on the menu. 2. Search the "Smart Life", then enable it. 3. Log in to your "Smart Life" account and password, then press the "link now" button. 4. Back to the menu, and press "Smart Home", then choose the "Devices", then press the "Discover" Button. 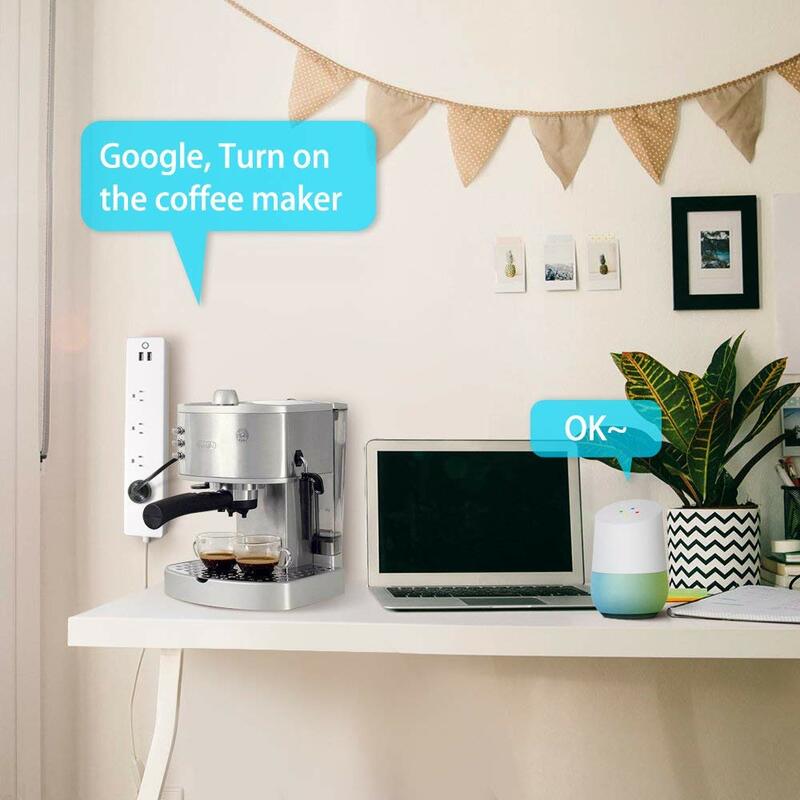 1.The wifi smart power outlet supports 2.4Ghz Wi-Fi network only. 2.The app compatible with Android 4.2 or higher;IOS 8.0 or higher. 3.Please do not connect to any household appliances over 1250W. 4.The 4 outlets can be controlled individually while the 2 USB ports are a group control.